The Rex Rabbit – Helping You Decide If The Rex Rabbit Is Right for You! One rabbit we have found ourselves in love with recently is the Rex Rabbit! If you are like us, then this velvety-soft cotton-tail has been hopping through your brain day and night! Most of us can agree there is nothing quite as adorable as a bunny. They are small, soft, and undeniably cute! Maybe you love their long ears or their large feet, or perhaps you have an affinity for their white fluffy tails. Whatever the attraction is, it’s easy to see why rabbits have stolen the hearts of many small pet lovers across the world. 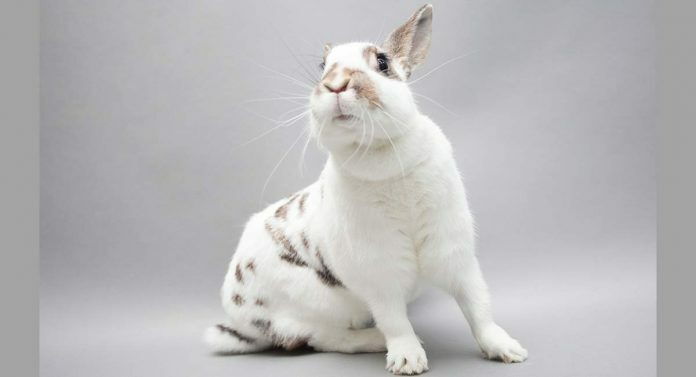 Are you truly curious about the Rex Rabbit and wonder if he would make the right addition to your household? Then you have come to the perfect place! In this article, we are going to explore everything about the beautiful Rex Rabbit, from his playful disposition to his plush, velvety fur, and everything in-between. So, what makes this gorgeous rabbit breed so unique? Let’s find out! The Rex Rabbit was previously known as the Castor Rabbit. It is named after the genetic mutation that causes their unique fur, which is lush, thick and velvety to the touch. They weigh 7.5-10.5 lbs and make lovely pets. Where Did The Rex Rabbit Come From? The Castor Rex Rabbit is believed to have originated in France in 1919, where a litter of wild gray rabbits was discovered to have a genetic mutation that caused this luxurious, short and soft fur. Soon after the discovery was made, the Rex Rabbit was deliberately bred to maintain this mutation and perfect its velvety coat. Originally farmed for their fur in the fur industry, the Rex Rabbit was formally introduced to the public at the Paris International Rabbit Show in 1924, where he quickly gained popularity amongst pet owners. Eventually, he found his way to the United States and has since become a rather popular companion animal. As previously mentioned, the Rex Rabbit is perhaps most famous for his unique, velvety coat. Although his coat is incredibly dense and plush, the Rex Rabbit actually lacks the longer guard hairs that most other common short-haired rabbits have. 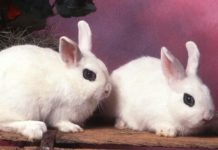 These guard hairs typically help to protect other short-haired rabbits from the outside elements, so a prospective owner of the Rex Rabbit should take care to keep the Rex Rabbit in a well-regulated environment that is not too hot or too cold. So why does the Rex Rabbit’s fur look the way it does? Well, each of the Rex Rabbit’s individual hairs grows short and even, resulting in this gloriously velvet look and feel. There are actually three varieties of the Rex Rabbit’s fur. The Rex Rabbit also comes in 15 color varieties, including the following. Rex Rabbits do shed. Although the shedding is light, allergy sufferers should still keep this in mind. How Big Do Rex Rabbits get? When it comes to Rex Rabbit size, you’ll find two different varieties, a regular and a mini. There is no giant Rex rabbit. The Standard Rex rabbit is a medium rabbit with a round body type, weighing in at 7.5-10.5 lbs. There’s a Mini Rex, too, a dwarf Rex rabbit. How big do Mini Rex rabbits get? The Mini Rex Rabbit is small with a compact body type. She generally weighs 3.5-4.5 lbs. The Rex Rabbit is known to be calm, playful, and incredibly maternal. She enjoys being around other rabbits and in fact, is known to mother them quite incessantly. Seeing as she is so social, the Rex Rabbit will thoroughly enjoy the company of other animals, most preferably ones she is raised with. She will also enjoy the companionship of her human counterparts, entertaining them with her antics and zest for life. The Rex Rabbit can be incredibly spirited and therefore makes a very amusing pet. This is one of the many reasons she does so well with children. She especially loves to play and hop! Although Rex Rabbits do make such wonderful family companions and are a favorite choice for parents looking to introduce their children to first-time pets, Rex Rabbits are fragile and can injure easily. Rex Rabbits should do well with older, more gentle children, but they should be supervised around younger children and children who are less careful. Baby Rex Rabbits are especially susceptible to injury, as they squirm more than adult Rex Rabbits when held. Therefore, it is best to have children sit while holding them to reduce chances of high falls that could severely injure or kill the Rex Rabbit. Keeping the above information in mind, the Rex Rabbit is known to be an intelligent and affectionate pet that is a joy to play with and care for. Although there are still not very many options for rabbit enclosures available, many rabbit owners get creative. Aside from the typical rabbit enclosure, some owners choose to build their own outdoors, while others opt to purchase dog crates and modify them so they are more bunny-friendly. There are also many rabbit owners who choose to let their bunny pets roam the house freely – after adequate training and bunny-proofing, of course! Rabbits love to chew, and it’s normal for them. But you’ll have to protect electrical cords and other tempting items from their ever-growing teeth if you let them roam. And yes, you can litter train your bunny, but she must be spayed or neutered first. While not the easiest of pets to train, the Rex Rabbit is very intelligent and can make a lovely home pet that does not require an enclosure at all. Still, prepare for your home to be one huge litter box until she is trained, as she just doesn’t know any better! She will need consistency with training and will require patience and a loving hand. Her litter box should be of medium size, filled first with litter and then with hay. You can begin the process of litter training by watching when your Rex Rabbit uses the bathroom, then placing her droppings in the box and putting her in the box after.She will then respond to verbal praise and gentle petting. If you prefer to have an enclosure for your Rex Rabbit, the most important elements needed are wire bottoms and a plastic base. The wire bottoms should be layered with rabbit-friendly bedding so as to be comfortable and safe for your Rex Rabbit. The bedding should be cleaned each day, spot checking to ensure soiled areas are removed. The bedding should be replaced, and the plastic base should be removed and cleaned thoroughly at least once a week. For those of you crafty enough to build an outdoor enclosure for your Rex Rabbit, be sure to remember that this breed of bunny is missing those longer, protective guard hairs, and therefore may be more susceptible to the elements. Take care to build an enclosure that has adequate shelter and will not be too hot or too cold for your Rex Rabbit. Always be wary of predators whenever building an outdoor enclosure for your rabbit. Coyotes, felines, and raccoons make formidable predators that can see your adorable rabbit friend as a tasty meal. Remember that raccoons are especially clever and can learn how to open enclosure doors if they are not intricately latched. Your Rex Rabbit should have a diet of high-fiber pellets and hay, as well as fresh water daily. We recommend a high-quality rabbit food as specified by your veterinarian to ensure the ultimate health of your Rex Rabbit. Adult Rex Rabbits will typically consume about ¼ cup of pellets every day per every 5 lbs. or weight. Rex Rabbits also love to indulge in fresh fruits like mango, pears, peaches, and apple slices. Never give your Rex Rabbit a whole apple, as apple seeds are toxic to them. Your rabbit will also enjoy veggies like carrots, lettuce, and celery. Always make sure you research what types of foods and treats are best for your rabbit and how often you can feed them these treats, as there is a long list of things (like apple cores) that can harm them. As far as grooming goes, Rex Rabbits are typically clean animals and will not require much grooming at all. In fact, too much brushing of their plush coat could cause damage to their fur. If the Rex Rabbit does need to be cleaned, a gentle scrub with a warm, damp cloth should do the trick. So how long do Rex Rabbits live? And how long do Mini Rex Rabbits live? When spayed or neutered, the Mini and the Standard Rex Rabbit have a lifespan of 7-10 years. The Rex Rabbit is generally a healthy bunny breed, but she can be prone to pododermatitis, also commonly known as sore hock, or bumblefoot. This is a bacterial infection of the skin that typically affects the part of the bunny’s legs that rest on the ground. If left untreated, sore hock can worsen and cause serious pain and health issues. 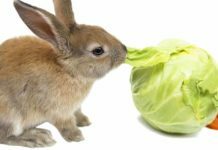 Although there are home remedies available, we always recommend taking your Rex Rabbit to a veterinarian who can administer the correct treatment and ensure the infection doesn’t worsen. Rabbits are prone to gastrointestinal tract stasis, a potentially serious condition that is unfortunately common. If your bunny stops eating, even for part of a day, and is not defecating, you must see a vet immediately. 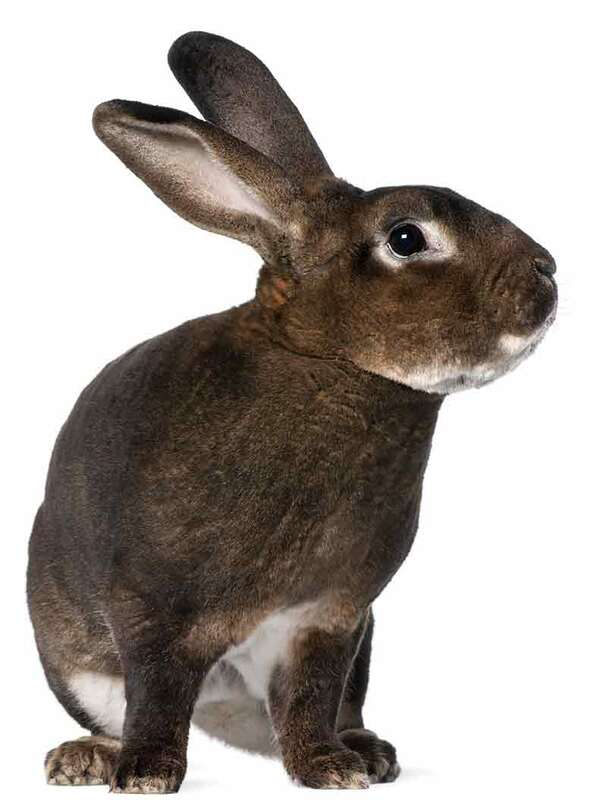 General rabbit diseases that Rexes can get also include myxomatosis, a viral disease which quickly becomes fatal, and Viral Hemorrhagic Disease, another contagious and quick-acting condition that often results in death. Rabbits may also be prone to abscesses, bacterial infections, and parasites. As with all rabbits, Rex Rabbits can also be prone to a number of dental issues. Believe it or not, Rabbit teeth never stop growing! However, most rabbits constantly chew, and this activity continuously wears their teeth down, keeping them at a healthy length. Unfortunately, sometimes a rabbit’s teeth will not be worn down enough and its teeth may grow into its jaw and face. When this happens, severe pain and infection ensue, causing loss of appetite, lethargy, drooling, and sickness. You can keep an eye out for the above symptoms in your Rex Rabbit and also catch this issue early on by checking your bunny’s mouth weekly. If you see any sign of this dental issue, take your Rex Rabbit to the vet immediately. Rex rabbits can also be prone to ear infections, so their ears should be cleaned weekly. Of course, we always recommend spaying or neutering your Rex Rabbit when they are around 4-6 months old. Spaying or neutering is actually beneficial to their health and can lead to a longer lifespan. Female rabbits especially can be vulnerable to uterine cancer when not spayed. 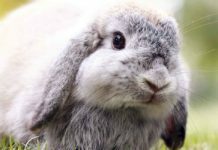 If you are looking into purchasing a Rex Rabbit, we recommend doing plenty of research first to ensure you find yourself a responsible breeder. Be sure to ask your breeder about health issues from previous litters and the parent rabbits. Is The Rex Rabbit Right for Me? By all accounts, the Rex Rabbit makes a fabulous companion pet for singles, seniors, and families with older children and other pets. Although the Rex Rabbit does well with other animals, a prospective owner should keep in mind that certain dogs and cats may not be suitable companions for your Rex Rabbit and should always be supervised when placed together. Although the Rex Rabbit does require some weekly maintenance as far as cleaning her enclosure goes, she is an all-around easy pet to care for. She requires little to no grooming and has very few health issues. She is not hypoallergenic and is known to shed, so prospective owners who suffer allergies should keep this in mind. Just remember that they are physically fragile, and as prey animals, they may require work and gentle treatment to become tame, affectionate members of the family. The Rex Rabbit is incredibly adaptable and does well both indoors and in outdoor cages, so apartment living is no problem. They can be easy and fun companions, and will make great, long-lived family pets with some care. However, domestic rabbits do not acclimate to the wild, so setting them loose is not a good idea. Don’t get one if you aren’t sure you can care for one! If you think the Rex Rabbit is the right pet for you, then congratulations. We are sure she will bring joy and entertainment to your home for years to come! Wagner, F. and Fehr, M. (2007). Common ophthalmic problems in pet rabbits. Journal of Exotic Pet Medicine, 16(3). Isbell, C. and Pavia, A. (2003). “Rex” in Rabbits for Dummies. Wiley Pub. : New York. Mancinelli, E. (2015). Pododermatitis in rabbits: An under-recognized problem. Vet Times. Harcourt-Brown, F. (2009). Dental disease in pet rabbits 3. Jaw abscesses. In Practice, 31. Harkness, J. E. et al (2010). Harkness and Wagner’s Biology and Medicine of Rabbits and Rodents, Fifth Edition. Wiley-Blackwell: Ames, IA. Snooke, T.S. et al. (2013) Skin diseases in pet rabbits: A retrospective study of 334 cases seen at the University of California at Davis, USA (1984-2004). Veterinary Dermatology, 24(6). Next articleBest Pet Carrier – How to Transport Your Pet Safely!